The Covered Bridge Photography of Traugott F. Keller Jr.
A native of Long Island, New York, Traug Keller spent a lot of time in New England. New England covered bridges are among the most well documented in the United States. Here are a few of his very best New England bridge pictures. Click on a bridge image to view the photo in its full size. Mr. Keller's card for this bridge was missing, but it is the Saco River Bridge in Conway, New Hampshire. Photographed July 31, 1957. No other information is available, but the bridge remains in place. The card for this lovely bridge, called Joel's Bridge, is also missing. It too traverses the Saco River, on U.S. 302 east of Conway, New Hampshire in the Redstone section of town. Likely photographed on August 1, 1957. The bridge was still in use until 1950, when it was bypassed with the intention to preserve it. It was destroyed by arson in the 1970s. Covered bridge in Coos County, New Hampshire on Mechanic Street in Lancaster, over the Isreal Creek. Built in 1862, 102 feet in length. Photographed August 2, 1957. The bridge is still there; the portal is now painted red. The "Plume Bridge," in Grafton County, New Hampshire over the Pemigewasset River at the Flume. The bridge featured a footbridge on one side. Photographed on August 1, 1957. Just 54 feet in length. This is a very famous bridge, and its portal has also been painted red. It remains in place. A covered bridge in Grafton County, New Hampshire, just east of U.S. 3 on the road to Beebe Road and Campton over the Pemigewasset River, 3 miles north of Plymouth. Called the "Blair Bridge, with two spans - one 144 feet in length an the other 153 feet. Photographed on September 25, 1958. The bridge remains in place. An interior view of "Sawyer's Covered Bridge, featuring a Town Lattice Truss construction method. Located in Cheshire County, New Hampshire over the Ashvelot River, north of Swanzey. Photographed on August 12, 1962. The bridge remains in place. 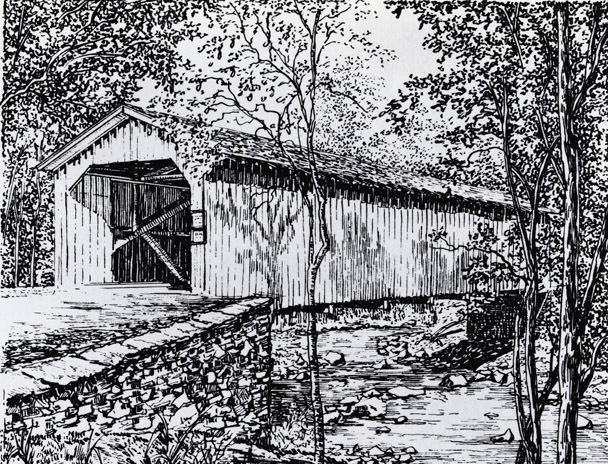 the "Melvin Bridge," Cheshire County, New Hampshire, over the Ashvelot River 1/2 mile west of Route 10 in Winchester. Length is 105 feet. Photographed on August 12, 1962. The bridge is now gone. The "Keniston Bridge," Merrimac County, New Hampshire, west of Andover over the Blackwater River. 61 feet in length. Photographed September 10, 1959. This lovely bridge no longer exists. A covered bridge in Aroostook County, Maine, east of Littleton on road to Woodstock over Meduxnkeag Stream. Two spans. Length is 174 feet, Features odd truss construction. Photographed September 8, 1959. The bridge remains in place. A covered bridge in Caledonia County, Vermont. The bridge carried the St. Johnsbury and Lamiolle County Rail Road over the Lamiolle River east of Hardwick. 102 feet in length. No date for the photograph, with it was probably taken on a 1957 trip, as the bridge burned down in 1959. The "Passumpsic Bridge, in Caledonia County, Vermont, on State Route 122 at the west edge of Lyndonville over the Passumpsic River. Included sidewalk on one side of the span. 120 feet in length. Photographed on August 3, 1957. The bridge was removed to the grounds of a nearby motel around 1960. The "Sawmill Bridge," Lyndon, Caledonia County, Vermont, over the South Wheelock Brook and Passumpsic River. 68 feet in length. Photographed August 3, 1957, the bridge is still in place. The "Schoolhouse Bridge," located in Lyndon, Caledonia County, Vermont, about 300 feet west of Route 5 on the road to South Wheelock, over the South Wheelock Brook/Passumpsic River. 42 feet in length; photographed August 3, 1957. Bridge includes sidewalk. It has been bypassed but remains in place. The "Taft Brook Bridge," in Orleans County, Vermont, 2.1. miles southwest of Westfield over the Faft Brook. 42 feet in length, Town Truss construction. Not dated on card, but probably shot in August 1957. This bridge, in such a lovely setting, is now gone. This covered bridge is in Orleans County, Vermont, south of North Troy over the Mississquoi River. Often known as the "River Road Bridge," it was actually just off River Road. Town Lattice construction, though using just a single pin at the joints - a local oddity. 93 feet in length; photographed September 24, 1958. The bridge is still in place. A covered bridge in Franklin County, Vermont, south of Route 36 in East Fairfield over the Black Creek. Constructed in 1865, photographed on September 19, 1967. The bridge remains in place, but is now closed and in very poor shape. The "Longley Bridge, in Franklin County Vermont over the Trout River, just off Route 118, 1.4 miles south. Built in 1863, photographed on September 19, 1967. 87 feet in length. Town Truss construction. The bridge is still there. 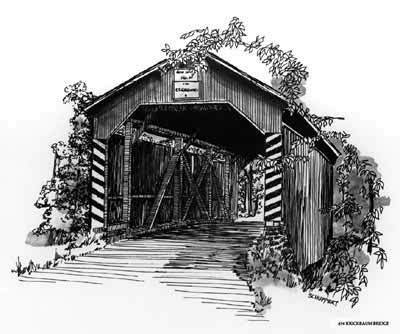 A great example of the "Kingpost Truss" construction style, This bridge is in Washington County, Vermont. Northfield Township, west of Route 12A over the Rocky Brook. Built in 1899, photographed on September 21, 1967. Just 38 feet long. The bridge is still there. The interior of the bridge pictured above. A fantastic covered bridge in Bennington County, Vermont, at Chiselville off Route 11 over Roaring Branch (indeed!). Built in 1870, photographed on August 11, 1962. 120 feet in length, Town Truss construction. The bridge is still there, but badly damaged by an overloaded town sand truck circa 1970. Now propped from below with concrete pillars, ruining this pristine historical view. A covered bridge in Washington County, Vermont, at Warren over the Mad River. 51 feet in length. Photographed on August 5, 1957. The bridge is still there. The interior of a covered bridge in Middlesex County, Massachusetts, at East Pepperell over the Nashua River, Town Truss construction, 150 feet in length, photographed on August 15, 1962. 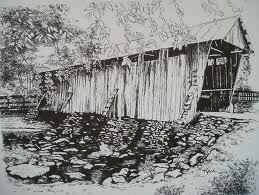 The bridge was removed in the early 1960s and replaced by a huge, ugly, modem "covered bridge." This view shows the "Town Lattice Truss." "Hart's Bridge," in Litchfield County, Connecticut, on State Route 128 at West Cornwall over the Housatonic River. Built in 1837, Town Truss style, 162 feet in length. Photographed September 29, 1958. The bridge remains in place. copyright 2011, handsome productions, inc. all rights reserved.